Sunshine Landscapes designs, builds and installs four season landscapes, and we follow the golden rule of landscape design: everything comes down to plant selection! Your personalized garden design takes into account your location, amount of sunlight and shade, how you use your space, elevation and steepness of angle, and any other special circumstances that affect your outdoor living space's needs. With the right plant selection, you can have year-round interest and a naturalistic, low-maintenance yard (or zero maintenance, if you prefer!). All plants that we install are top quality, healthy, the best of their variety, and hand picked from a selection of eight to twelve trusted nurseries that we work with. 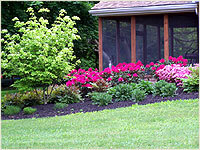 We are also experts at maintaining your plantings. Our maintenance and emergency services are second to none. We are prompt, professional, and reliable, and will keep your outdoor living spaces looking well cared for. With our expert landscaping and professional tree and shrub care services, your yard and gardens will be the envy of your neighborhood!